A. lagopus reproduces sexually. The life history strategy is iteroparity, which involves producing multiple litters over extended time periods and increased parental care along with enhanced energetic investment per offspring. The fox is monogamous, mating only once a year, and may mate for life. It is often found in small family groups consisting of one male, two females (called vixens), and the young born that year (Nowak, 1999). One of the vixens is typically a non-breeding female from a previous year’s litter that stays on to help care for the next litter before moving on. The mating season occurs during the months of February through May, with the litter typically born between April and July. 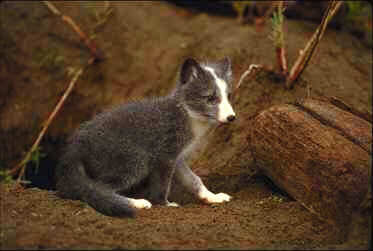 The average gestation period of a female Arctic fox is approximately 52 days. 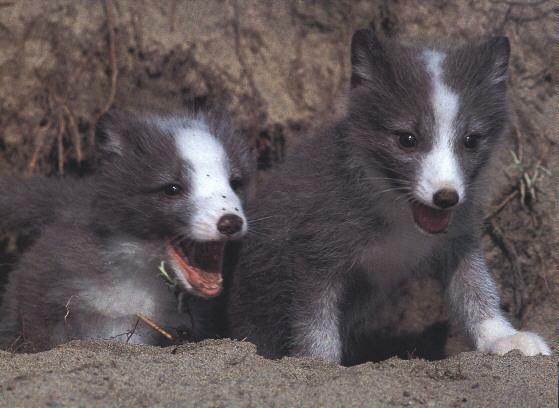 During years of prey abundance, the Arctic fox may have a second litter of pups later in the year (McGonigal, 2001). The number of pups in the litter varies based on environmental conditions (primarily the availability of prey), but can be anywhere from 2 to 25, although the average is typically somewhere between 6 and 12 (Nowak, 1999). Pups normally weigh around 57 grams at birth, and stronger pups in the litter may kill and eat their weaker siblings during times when food is scarce (Sale, 2006). The young reach maturity at around nine months of age and are capable of breeding when they are ten months to a year old, although most young do not survive their first six months of life. Arctic fox numbers are very closely related to the number of lemmings, with large litters occurring during years of maximum lemming abundance. In the wild, Arctic foxes typically live to be five to seven years old, although in captivity they can live for up to 16 years. When courting, a pair of foxes will playfully chase and fight with one another. They communicate with a sort of barking yowl that can carry over great distances, as well as ear and tail position and tail movement. Compared to other foxes, the male Arctic fox is a very attentive caregiver and provider during the denning season. Dens are normally some distance apart, and are usually constructed in light soils and used for a number of generations. The dens typically have 4-12 entrances, although after years of use they become quite extensive and often have more than 100 different entrances!